You might think that stray and feral cats are the same thing, but there is one main difference. Stray cats become socialized to people while feral cats do not. What’s socialization? Cats who are friendly to and enjoy companionship with people are socialized. Socialized cats include both pets and strays. Feral cats either have never had contact with people or contact with people has diminished over time. Why should I know the difference between stray and feral cats? Since stray cats have social interaction with people, they can readjust to living with people. You can bring them into their homes and adopt them. Feral cats are not and cannot be socialized. They will not adjust to living with people, so you cannot adopt them. You can socialize kittens born to feral cats and adopt them into your home. How do I tell the difference between stray and feral cats? Observe cats outdoors to determine whether they’re stray or feral. Look for these signs to make your decision. Stray cats may approach people or houses, but feral cats will avoid people and seek hiding places. Stray cats usually live alone, but feral cats may belong to a colony. Stray cats might walk like housecats with their tails up, but feral cats might crawl or crouch and protect their bodies with their tails. Stray cats may meow or respond to your voice, but feral cats won’t meow or purr. 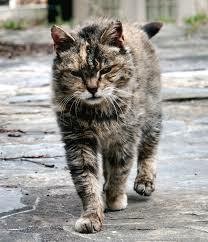 Stray cats are usually dirty, but feral cats keep their coats clean and well-kept. « Is it safe to kiss pets?